You started using the word Friday night, testing the taste of it like a fine wine. At first it was snakes. “I hate snakes,” you said. There were no snakes present. “I hate snakes. I hate snakes,” you added, your tone no more vexed than normal. “Why do you hate snakes?” I asked you. “I hate them,” you said, smiling. You start preschool in two days. Today was the open house. We went to meet your teachers, to play with the other children, but mostly to remind you that this was where you would spend nearly every weekday morning for the next two years, to remind us that you’re growing up. The other children hid behind pant legs and spoke in whispers. You bounded in, found your teacher, and introduced her to the baby burrowing his way sleepily into the crook of my neck. You picked up scissors and cut paper circles into pieces for nothing other than the feel of it. You smiled and charged your way through the room, taking in everything, manipulating everything, fearless. It’s strange having an extrovert for a daughter, watching you work the crowd while I, holding Felix like a shield, hovered quietly at the perimeter. This is a good thing, I recognize: you’re confident, you enjoy other people and you know how to interact with them. Yes, there’s the nebulous future of strangers and boyfriends. But it’s not that. You know what to say to people in a way I never do, and that, more than anything, is terrifying. We took you to the science center on Saturday, mostly to let you play, but also to take photographs at one of the few remaining photo booths in the city. That’s part of your care package: indestructible snacks, changes of clothing, a space blanket, and a care photo and letter from us in case something unimaginable happens. It was a tight fit getting all four of us in there; Felix grabbed your hair at one point, and it was a strain just to keep all four of our heads in frame. We managed, barely. 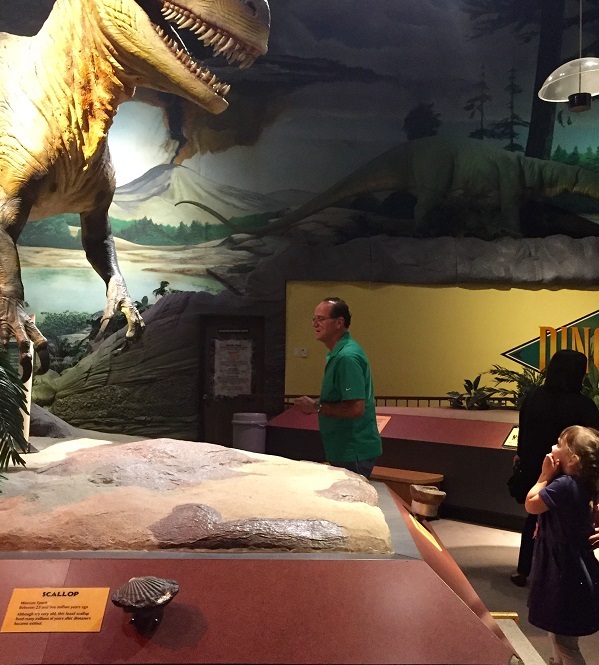 You gasped at the animatronic dinosaurs, cooed at the butterflies and reeled back from them if they got too close. You looked at bugs and lizards and snakes (for which you were too excited to recall your newfound animosity), but refused to touch the starfish in the tide pool even when I put my own hand on them. “It just feels like a rock,” I told you, as if this were somehow incentive. Instead you asked a random nearby woman to touch it as well. She did, and asked if you would too. You said no. Then, it was time to go home; Felix was tired, it was afternoon and we hadn’t eaten. I asked you to come and you ignored me, fixedly examining a plastic dinosaur skeleton. I came over and gave you a hug, but you pushed me away. And you said it. It hurts more to type it now, honestly; now, I combine it with every time you will say it to me in your life. What I did at the moment: I backed away, because I knew I had to. I wasn’t angry, or even very sad. Instead I sat on a nearby bench, staring at my feet like a community theater actor, waiting, trying to look sad. Your mother spoke to you for a few minutes, and finally, begrudgingly, you came over and apologized. But why wouldn’t you say it? There are so many rules. Wash your hands before dinner, go potty before leaving the house, be quiet while Felix is sleeping, leave when your parents say so. You have so little control over your life, have to take so many things like germs and stains and the benefits of napping on poorly-translated faith. And now you have this one weapon, this one source of power. The original crime is already relegated. And in a way, this is the desired outcome: we want you to feel safe, we want you to be able to take risks and talk to teachers and enjoy what you want to enjoy. This is just the price of it, a far better price than the alternative, mistrust and fear. You stopped hating me. Well, first you fell asleep in the car, woke up in time to sit in the grocery cart, ask for your cereal bar and to be able to run through the frozen aisles, find your footing in old routines. That night, as we sat on the couch watching a show, you tested it again, carefully. “No, I do. I do like you,” you countered, as if I were making it up. “Oh, okay. I love you, Sylvie,” I said, and kissed her on the forehead. “I love you too, dad.” We went back to watching TV.